Black, white and shades of orange set off the upper wings of a painted lady. Bright orange, black and white, a brush of pink underneath; these butterflies are too small and swift to be monarchs. 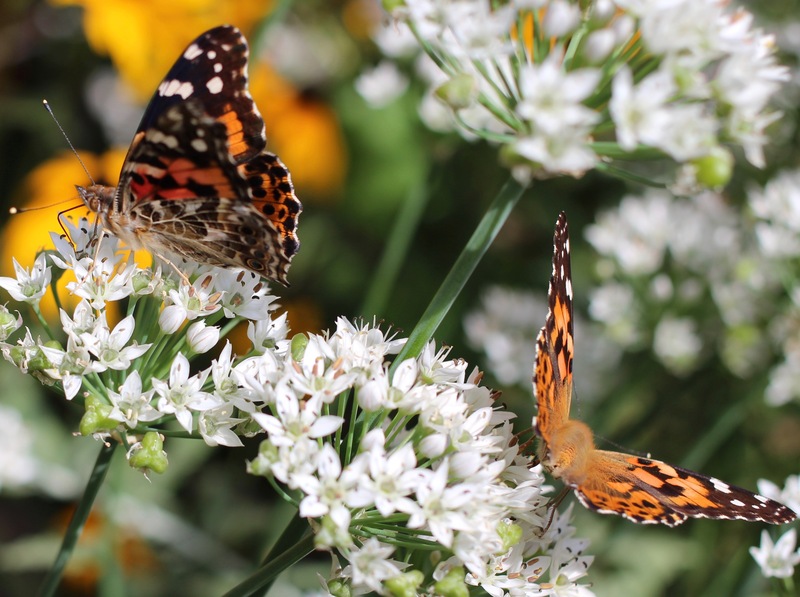 Painted ladies (Vanessa cardui) are everywhere; perched on the roof, fence and sun-warmed sidewalk — and especially in the garden (15 to 20 most of the time) on asters, Joe-Pye, sedum and garlic chives. The last time I remember seeing so many was in 2001 or 2002. My neighbor’s sedum ‘autumn joy’ was covered with the butterflies. Our son was little and we sat together in a patch of warm September sun watching the bright creatures sipping nectar. Why such large numbers? 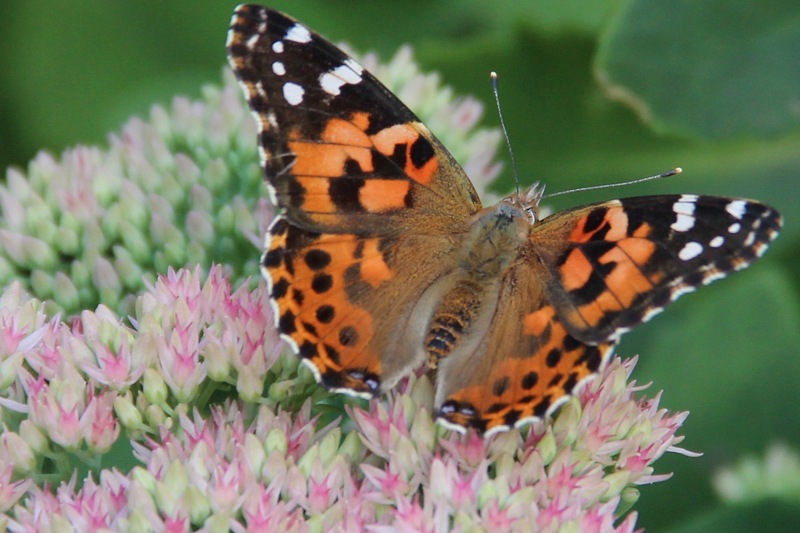 Painted lady populations have cyclic highs and lows. Numbers are high now, possibly linked to good weather in their wintering grounds. Unlike many butterflies in the north, the ‘ladies’ migrate, and that’s happening now. Scientists think that the painted lady has the widest range of any butterfly in the world, living on parts of five continents. In North America, adults overwinter in the southern United States and Mexico, but cannot survive the northern winter. Four eyespots along the edge of the hind underwing help identify a painted lady. An easy way to identify painted ladies is to look for four brown ‘eyespots’ along the edge of the hind underwing. 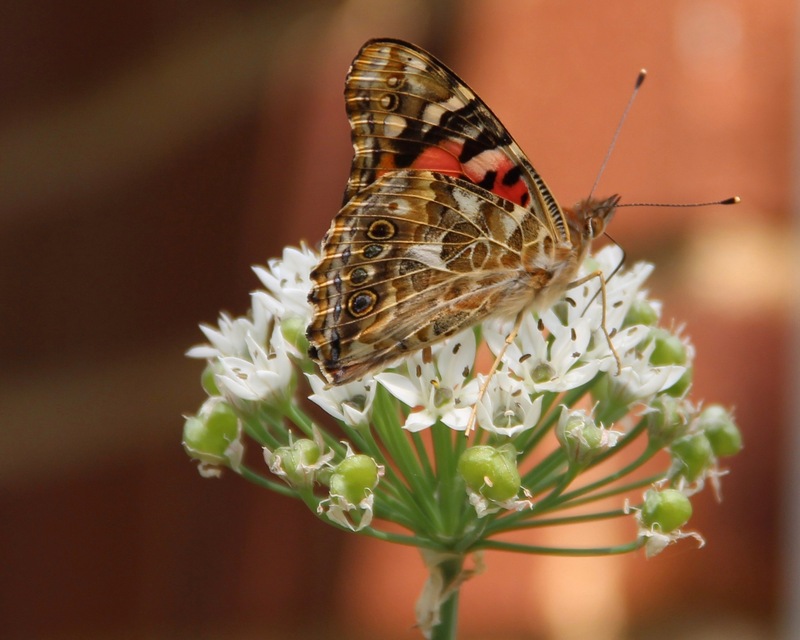 The closely related American lady (Vanessa virginiensis) has two large spots in the same region. Another relative, the red admiral (Vanessa atalanta), doesn’t have any spots on the underwing. A painted lady nectars on native Joe-Pye weed (Eutrochium maculatum). I enjoy identifying and learning about all of the creatures that visit our garden. Perhaps, the most satisfying piece is sitting quietly next to the garden and the butterflies, hearing the slight sound of their flickering wings and the hum of bees, and watching the beautiful dance of color as the ladies move among the blooms. 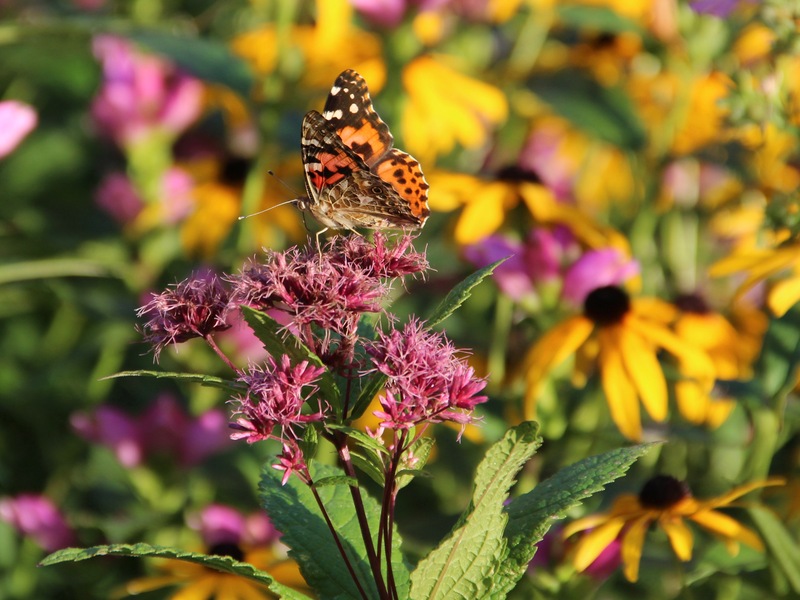 If you live in the Midwest, look at your garden, a field of flowers, or perhaps a roadside this weekend, and you might spot the painted ladies. Garlic chives (Allium tuberosum) are very attractive to the painted ladies visiting our garden.